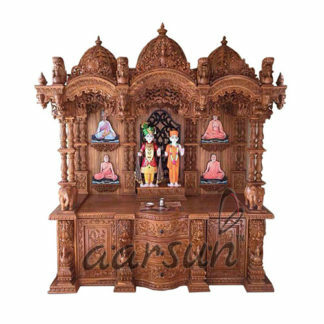 Aarsun woods brings to you the handmade wooden puja temple made up of fine Teak wood along with beautiful carving done by our skilled artisans. There are three domes at the top placed the top of the roof center Ganesh design with peacock carving at the top.Below that there is main place for the deity.There are carved pillars at the front of the temple along with beautiful carving at the back of the temple. At the front of the temple with beautiful carving door. Below that there is base area where there are two drawers for placing puja essentials like incense sticks,match sticks,rose water etc. The base area is fully carved by our skilled artisans and it gives very traditional look to the temple. The temple is made up of Teak wood except the base and the ceiling where ply wood work is done. The temple is best suitable for home and for the offices and give traditional look to your home.